Create a Twitter app at https://apps.twitter.com. In Mule, select File > New > Mule Project. Name the project TwitterConnector and select Finish. Near the upper left-hand corner of Mule, select the Open Exchange icon. Drag the HTTP connector from the right-panel of Mule to the canvas. 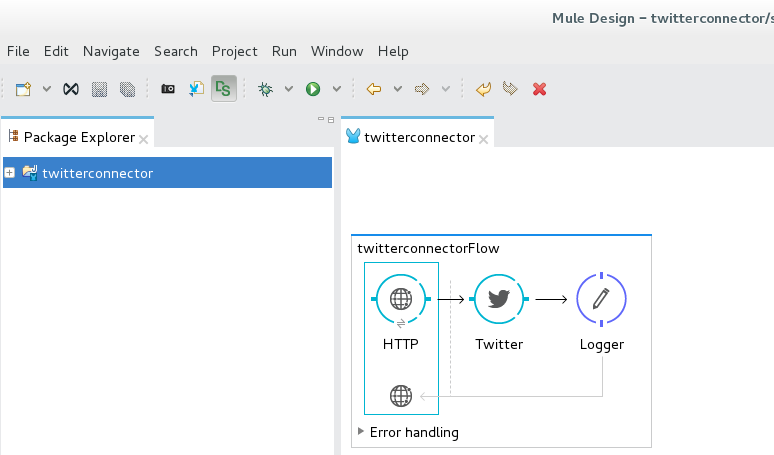 Connect the Twitter connector to the HTTP connector. Connect the Logger connector to the Twitter connector. Next to Connector Configuration, select the green plus icon and enter your Twitter Access Key, Access Secret, Consumer Key, and Consumer Secret. Select Test Connection to ensure the connection can be established. Set Operation to Get user timeline by screen name. Set Screen Name to #[message.inboundProperties.'http.query.params'.sname]. Navigate to http://localhost:8081/gettweets?sname=john_doe, and John Doe's last 20 tweets should be displayed.